Sony hasn’t released the direct feed trailer on the PSN yet (I want it HD! ), but here’s a capture of the G4TV feed. This looks stunning, the creature reminds me of Falcor, the luck dragon from The Neverending Story….don’t know when this game is coming, but I can’t wait, enjoy the trailer below. I just watched this off the PSN(Playstation Network), and wow I think this is pretty cool. It’s a game or more like a virtual pet app that works with the Playstation Eye camera for PS3. They show a cute monkey that you can pet, play with, even make toys for it to play with, this looks great for kids. No word on availability yet. Check out the vid below. 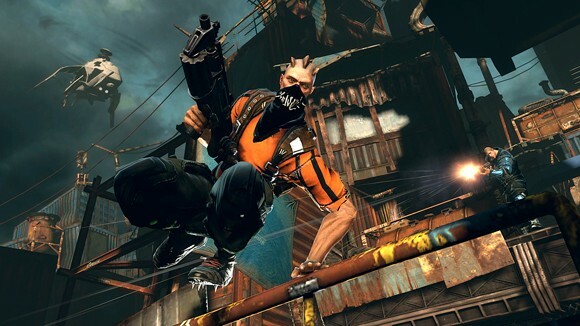 Publisher Bethesda, who we heart very much, has finally showed off their latest offering, Brink. It’s a futuristic first person shooter with RPG elements, some parkour stuff, and an open ended mission structure. This bad boy sounds a bit complex, I 1st came across it on this joystiq post, then kotaku which they sum up as “think Team Fortress 2, Mirror’s Edge and Fallout 3”, but they go much more in-depth, so please check out their post on what could potentially be Bethesda’s next hit. Looks like Sony also wants to bite into some of Nintendo’s casual market share, today announcing their answer to motion controlling, sorry no cool names like ‘Project Natal’ or dates or pricing, just tech demoing on the E3 floor. Sure their pack in controllers on the PS3 has some motion sensing with the six-axis technology, but it’s nowhere near as intuitive as Nintendo’s Wiimote, or what Microsoft’s upcoming Project Natal seems to be. 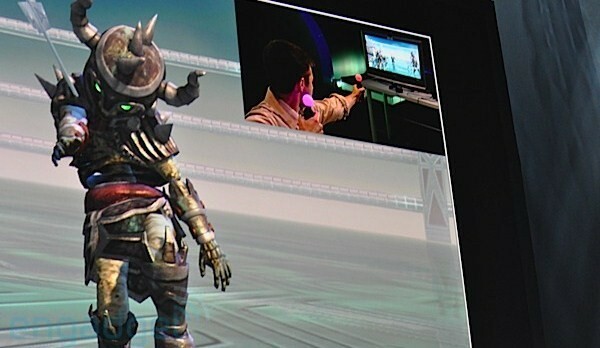 Here’s a little description from the joystiq post on it “The PlayStation Controller will work in conjunction with the PlayStation Eye, which will capture movements of the motion controller for “true one-to-one tracking.” Sony showed off a variety of tech demos for use of the motion controller, including sword swinging fantasy, tank-based third-person shooting, archery, tennis and drawing — all of which are meant only to demonstrate what is possible with the motion controller and is not the final software for the new peripheral (Those looking for a PS Sports title, sorry).” Kotaku posted some news about it as well, check it out. One of the worst kept secrets of the gaming industry this past year, the PSP Go, has been announced at E3 today. Dropping on Oct. 1st at a hefty 250$ price tag, updates include a slide out button interface, the elimination of the UMD drive so you’ll get your games through Sony’s download service, PSN(Playstation Network), 16Gigs of flash storage, memory stick micro slot and the addition of bluetooth, which will possibly provide smoother interactivity with the PS3. Check out kotaku’s hands on impressions straight from the E3 floor. The Last Guardian was announced today for the PS3. We don’t have a direct feed trailer yet, but rest assured this game will probably be amazing. It comes from Team Ico, the guys responsible for a couple of my PS2 faves, Ico, and Shadow of the Colossus. To me these games settle the argument of whether games can be art, and for some reason they hit my emotional buttons as well. A concept video(under the name Project Trico) leaked a few weeks back, that’s said to be a year old, and it looked great. We also don’t know much about how the game is, but it looks like it’s about a boy and his giant pet cat/dragon exploring a fantasy world. I can’t wait to see the final product. The Good – OMG, full body motion detection camera from Microsoft! Puts you in the game, Matrix here I come! I can’t wait to hang with Milo. Splinter Cell Conviction exclusive to 360, sweet. Metal Gear Solid series comes to the xbox platform once again. PSP Go! looks cool. God of War III, whoohoo! DJ Hero, my dreams finally come true in console form. Team Ico brings me “The Last Guardian”, yeah baby! New Super Mario Bros. 4 Wii, Super Mario Galaxy 2, hello, the kid in me is taking over! The Bad – Awesome looking PS3 exclusives God of War III and Heavy Rain don’t come out till next year? Man are you serious?!? More like PSP Go Home! Hey Microsoft, how bout an idea of when I can get this ‘Project Natal’, and how much? Nintendo, you make me wet my pants with the Super Mario Galaxy 2 trailer, and tell me I can’t get it till next year? Are you just begging me to sell my Wii?? Oh yeah, how bout 17 more Guitar Heros while we’re at it Activision? New Tony Hawk with a board? cuz I just want more peripheral junk in my house! The Ugly – Project Natal will make me physically tired of using the 360 interface….Wii Vitality wants to check my heart rate, how bout this-beeeeeeeep….Oh yeah, nice Sony, way to show a lame lookin prototype to motion control, it’s like the Wiimote and Project Natal had a really lame baby. …Will this really work? This Project Natal? There was all kinds of announcements during the microsoft press conference at E3 today, constantly nipping at the Wii’s heels for some of that casual market money that they’ve gotten through the Wii Motion,and now they showed off their long rumored camera. A full body motion sensing camera, whoa. Check out the youtube vid below for the potential for gaming, as well as some updates to the 360’s system interface that allow you to control it kinda like that OS in Minority Report. Can it really work as well as their showing it off to be? Time will tell. Pricing and release date to be determined.